The Bee Gees still haunt the airwaves with disco-riffic leftovers, like the fading echoes of screeching crickets in a gymnasium locker-room. Bruce Springsteen is a rising star and not a crusty old guy in blue-jeans. Michael Jackson is still black. Mostly. Arcade games like PacMan, Defender, and even Ms. PacMan are getting long in the tooth, supplanted by new addictions like Time Pilot, Robotron, StarGate, and TRON. Reagan is in the White House and Russians are still the bad-guys. One mysterious, rather heavy, rectangular package. It corresponds to nothing on my Christmas list. Opening that heavy box, and scarcely being able to even breathe for many long minutes. 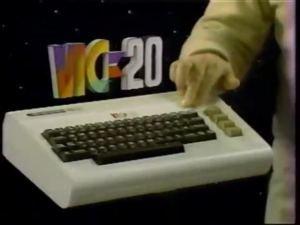 A VIC-20. A computer, a real honest-to-God computer of my very own. No more sharing with people at school or waiting for them to become available. No more madly rushed hammering on the keyboards in study hall, typing in the pages and pages of handwritten code from my dog-eared notebooks, and trying to get it saved on disk before the class bell rang. Nowadays, even people who lived through that era might think I'm a little bit nuts. But it truly was, for me, a life-altering experience. Not the least of which because of the glorious status of the computer itself. Status? For a personal computer? In the 1980's?!? Yes my friends, status. Status with a capital-S. Geek-cred, before there even was such a term. Why? My "first computer" was the very machine which William "Captain Kirk" Shatner promoted in that now-famous-for-it's-1980's-cheeziness TV commercial. Gratuitous VIC-20 Shatner YouTube Link here. "Doing the Shatner..."
Anyway, I recently decided that I needed to dive back into some gaming, since I've been insanely busy for several months, and have been feeling like an out-of-touch "Grumpy Old Fart". I decided to begin by dragging out my meager retro-computer collection, taking stock, and finding out just what might still be working after all these years wrapped in plastic garbage bags. 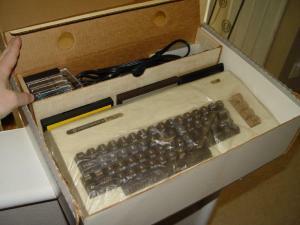 Here are some pictures of the original, now somewhat battered cardboard box which houses my VIC-20, "The Wonder Computer of the 1980's." Voila VIC! 8-bit VIC... a beautiful thing. Note the gaudy marketing and advertising, plastered in-your-face, all over the box. This was a COMPUTER, NOT A TOY. It was FOR THE WHOLE FAMILY. It was FRIENDLY. It was CUTE. It had COLOR. It was (ostensibly) POWERFUL. Of course it did, the box says so! 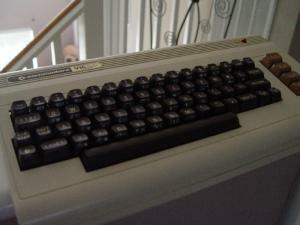 While advertised as a "personal computer that could play games", the VIC-20 could best be described as, "..a game console thinly disguised as a personal computer, which, with a lot of effort and no small amount of expense, could be upgraded far enough to actually allow you to DO something relatively 'computer-y' on the machine." Honestly, I kinda wish Commodore had spent less money on the full-color packaging, replete with splashy photos of the "Techno Brady Bunch Boys". Then they could've included more RAM in the base model unit. Even at the time the VIC-20 was released, that 3,583 free bytes of RAM was rather meager. 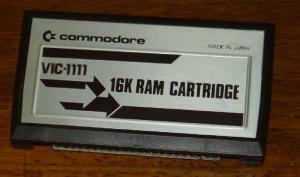 The earlier Commodore machine, the PET 2001, came with almost double the free RAM; 7167 bytes. Though it was possible to increase the on-board RAM in the VIC by installing one of several expansion cartridges, those were terribly expensive. I knew this, even as I admired the machine, but I figured I could work around it for a while. Commodore 16-K Expansion Cartridge: This thing cost $200?!? VIC-20 Fully Loaded: "My God! It's full of RAM..."
Bless him, my Dad knew how many hours I spent scribbling down programs in my notebook, and that I talked non-stop about programming the machines at school. Figuring that I couldn't really do a lot of programming in 3.5 kilobytes, he splashed out for the 16K expansion module. My machine would have a whopping 19.5K of RAM! Luxurious! I could do anything with that much space! It was like a vision from Heaven. Really, no joke. In that moment, my future as a computer and technology nut unfolded before me, like a magic carpet leading through to Wonderland. (Bear in mind that TRON had just come out not long before, so my vision of Wonderland was filled with light-cycles, data-discs, and a lot of curvy women in luminous spandex.) I've taken a couple bizarre twists and turns along the way, but ultimately, the vision of that day was right. I can remember carefully scrutinizing the few remaining packages under the Christmas tree---nothing even vaguely box-shaped remained; only sweaters, socks, and that ilk. I think my father read my face, because he then made a comment about the cost of peripherals. Grateful and stunned by what I'd already received, I mentioned that I could certainly "make do", until my birthday or something. I meditated on how much typing in programs, over and over and over again, really sucked. I meditated on how, after leaving my machine on for 2 days so I could play the same game, we would get a power bump. I meditated on how, after spending HOURS typing in some program I'd devised, a bug in my code would occasionally send the machine rocketing off to LA-LA LAND. Requiring a reboot, and more HOURS of re-typing; which really sucked. I fasted from lunches at school. I fasted from candy and gum. I fasted from comic books. I fasted (and this one REALLY hurt) from the arcade games in Aladdin's Castle at the mall. Every dime of lunch money, milk money, allowance, Christmas card money, and shaken-out-of-my-piggybank-savings, went into "The Great Tape-Drive Acquisition of 1983". Every spare moment, at home, in study halls, on the bus, I spent reading the programming books, writing test programs, learning the fine art of debugging my heinously crap code. 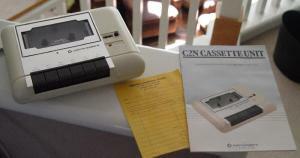 The whole time I watched for sales at every local store which carried Commodore equipment. And after a time, an eternity of waiting, punctuated all the while by the growling of my eternally hungry teen-aged stomach, I scrounged together enough money to buy an official Commodore Datasette unit. Nearly all of my liquid cash consisted of 7-1/2 pounds of loose change, but I had the $70, with a teensy bit of room to spare. 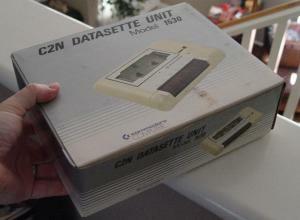 I've always remembered the day I bought the Commodore Datasette as being a dark, wet, and cold Thursday night in April. But when going through the boxes and repairing my VIC-20, I found the actual receipt for the thing in a box--turns out it was a dark, cold, wet night in May. I guess I fasted a LOOOONG time. You might think that my troubles were over at this point, that with this resource I could now explode in my rate of development. Not really. For those who never lived during that time, here's a hint: Cassette drive storage was slow; mind-numbingly slow; the go-and-make-yourself-a-sandwich kind of slow. 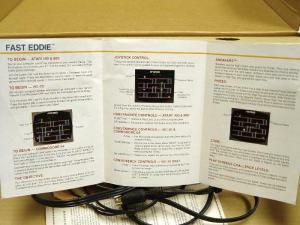 Most of my gaming on the VIC-20 was limited to the type-in programs published in magazines like, Compute! and Compute! 's Gazette. There were a mere handful of others, which I was fortunate enough to pirate from a cousin. 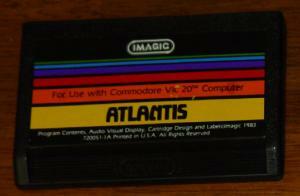 There wasn't much of a pirated-games scene for the VIC-20, at least not in the little town where I lived. Everybody was too busy swapping Apple ][ and TRS-80 game disks. 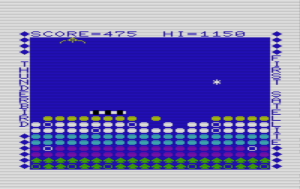 There was one type-in game which held my attention for quite a while: Thunderbird. Thunderbird gameplay video on YouTube. Beware the might of THUNDERBIRD! To my surprise, this game had my mother addicted for a WHILE. For the most part, I had to leave my VIC-20 connected to the little black-and-white TV in my bedroom. Occasionally though, I would be allowed to drag it all out and connect it to the big color TV in our living room. After getting Mom hooked on Thunderbird, I had much easier access to the big TV. However that came at the cost of losing control of my computer for an hour or so while she played. Thunderbird was a decent knock-off of BreakOut, worked surprisingly well for a game written completely in BASIC, and even added a few new twists to the gameplay and look of BreakOut. For one, the players paddle was replaced by the character-graphics pictograph of a bird, "The Thunderbird". Another big change was that you played over the TOP of the game-field, rather than beneath. The third twist was an interesting game-play element--the lightning strike. 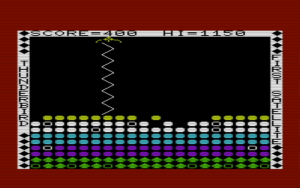 Hit one of the open circles in the playfield, and a "lightning bolt" would arc downward from your bird, hitting the playfield, and laying down some extra multi-color blocks on top of the existing ones. 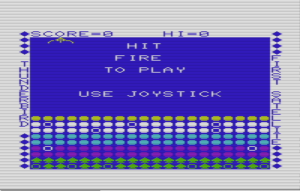 This made the game much harder, as it added a Tetris-like element. Namely, by giving you a lot less room to maneuver because the blocks were stacked higher, and thus closer to your bird. Towards the end of a level, it would not be uncommon for the ball to repeatedly smack several of the circles in rapid succession--stacking up extra blocks in the most inopportune places. Sooo complicated....: How did we ever MANAGE this complexity?!? In keeping with the software of that era, the Black Hole (YouTube Link to gameplay.) 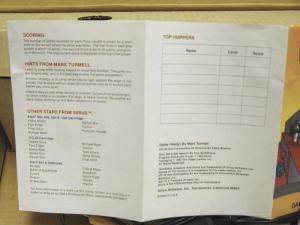 game pamphlet also clearly displays the name of the game author; Tom Griner, of Creative Software. 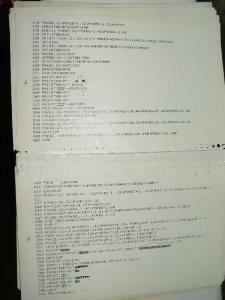 This was the time of "the bedroom coder", when most games were written by 1 or 2 people. 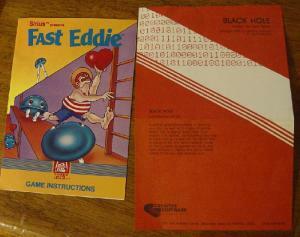 In keeping with that, it's cool to note that both the Black Hole and Fast Eddie pamphlets have a 'Personal Note' from their respective authors, featuring game-play hints and the like. For my part, I miss this kind of thing. Collecting games was like collecting record albums. Personal notes in the liner made for a much greater emotional bond to the game, because as a gamer I always felt a personal link to the creator of the software. The Fast Eddie platforming game, was actually quite good compared to other games at the time. Note how the insert clearly features the author's name: "..originally written by Mark Turmell of Sirius Software, Inc." The faceless corporate B.S. hadn't yet begun. Neat Historical Note: If you look closely at the Fast Eddie brochure, it reveals an unusual twist for that era: the VIC-20 port and the C-64 port were done by a lady; Kathy Bradley. I'm not aware of too many women in programming and gaming at that time. Fast Eddie had fast, smooth action, and decent joystick controls--which was actually somewhat uncommon for the VIC. Many games released for it were rather rubbish in one area or another. (Fast-Eddie Gameplay on YouTube.) If you look closely at the front of the insert pamphlet, the game was modestly released by 20th Century Fox, with the tagline: "Games of the Century." Sadly, I could not find my cartridge of Omega Race, possibly the best arcade-port for the VIC-20 at that time. It appears to have been lost to the mists of time. I may have to dig one up on EBay at some point. With the laser-like vision of 20/20 hindsight though, I can now categorically state, "Not having a bunch of games was a good thing, nay, a GREAT thing." 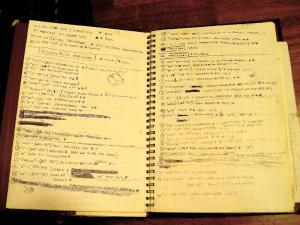 It forced me to write my own code, to research and read and test and devise my own algorithms. Learning how my VIC-20 worked, inside and out, from BASIC to Assembly language to the physical electronics, formed me in profound ways. It gave me a love for technology, and drove me on to become the engineer I am today. (Infinitely curious, a little bit crazy, and prone to outbursts against stupid uses of technology.) I'm grateful now, for the struggle that was. I copied very program, read all the books, and soon wrote my own code, i was far to interested in graphics over substance back then. I spent to much time trying to make stuff look good and worried to little about game play (ZOWIE i could work for most any major dev with that attitude!) My first true game was on a TRS-80 i made the crudest Pac man clone ever.. using hte "generate a random square on screen" program (one of the first one you learned in most books back then after the "hello world" stuff i stole the code and made a "box" (hey, the trs-80 didnt have much more then lego blocks for building.. 4 squares where the front 2 disappeared (slightly different times so it did look better then 4 block/2blocks) that you moved with your arrow keys (did it have arrow keys? i think i used the Oregon trail keys) and you had to eat the dot, and it would just reappear.. later i made more dots show and the last thing i did was make some poison.. you didnt want to eat them.. had it all on a timer.. if you ate like 20 in a minute you got 1 more minute, etc.. cool thing for me.. i caught teachers playing it. later i made a maze game .. i wont go into what a 14 year old made as its beyond juvenial and i cringe when i think about it..
yes very cool write up.. thanks, look forward to the 2nd part. Thanks for reading Clok, I'm very glad you enjoyed it! ...minute you got 1 more minute, etc.. cool thing for me.. i caught teachers playing it. later i made a maze game .. i wont go into what a 14 year old made as its beyond juvenial and i cringe when i think about it..
And I COMPLETELY understand cringing when you look back at what you wrote as a teen-ager. I'm going to be sharing some of my own ridiculousness in the next installment. Epic post! I was a bit too young for the VIC era, being only four. I do remember when my dad bought it, though, and explaining how it was a Real Computer. 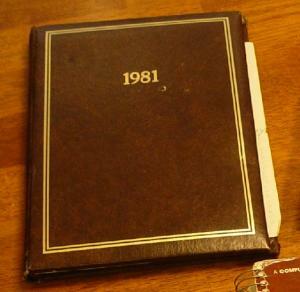 We upgraded to a C64 soon after though, so I tend to blur the two together a bit in those early days. 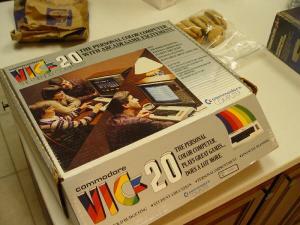 The VIC-20 was my first computer too. I got it in fifth grade, age 10, but soon sold it for a C-64. 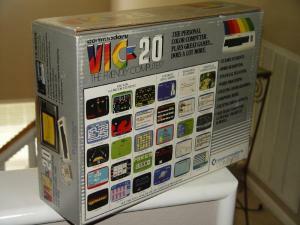 I never had much for my VIC-20 other than some cartridge games. Yes, mine is a pretty early version. I have it stuffed back in the box right now, so I can't easily check, but it's a low serial # model---something below 100,000. The problem with the early ones is that the power brick gets hot as blazes---Google fails me, but I remember reading in the newspaper about a couple house-fires where the power-block was suspected. (Growing up in Pennsylvania, there was a lot of news about Commodore... kind of like rooting for the home team.) The argument for switching to the same power supply as the C-64 was that it made sense from a parts/purchasing/cost-effectiveness point of view.... but I half-suspect it was also the fear of lawsuits that caused them to upgrade. Another point, the quality of the power-switch on my early model is _GARBAGE_ compared to the later models I've played with. (I put in a new power-switch in the next installment..) It started acting odd after a couple years, and was utterly frozen up when I took the VIC out of the box last week. As for the RF shielding and interference problem, that can be improved on the newer ones with some of that foil-backed cardboard & a couple wires grounding things together. Though in your case, it might be easier to disassemble the keyboard from the top-half of the clamshells, and swap them. (Or pick up a parts-only VIC on Ebay for $15 and pull the keyboard out of that.) I believe the connector/pinout for the keyboard is the same between all models. Ahh, the mega-cart. I _HAVE_ to order one of those things.... the Llamasoft games alone would be worth it. And Frogger'07 looks amazing.